As I mentioned in an earlier post, we’ve been reviewing our curriculum design over the past few months. When I wrote that post, we were in the process of weighing up different options with regards to the overall structure, focus, and length of our learning journey. Based on the feedback we received, we’ve decided to offer a more streamlined six-footstep learning journey for this September. This time round there will be a two-week gap between the different footsteps to allow for a more leisurely pace than last year’s one-week interval. Our new learning journey will be “stand-alone” for those students who can only participate in Out of Eden Learn for one semester or an equivalent length of time. But it is also the first of two parts of a longer “core” journey for those students who are able to continue. In this way, we are effectively offering the choice of both shorter and longer learning journeys on our website. What do we mean by a “core” learning journey? Looking ahead, we hope to offer a variety of learning journeys. For example, we eventually hope to offer options tailored to students studying subjects like history, the visual arts, geography, or English language/ literature. For the moment, however, we are only offering one general – or “core” – learning experience that educators can incorporate into a variety of learning contexts. Its purpose is to introduce educators and students to the organizing principles of Out of Eden Learn: slowing down to look closely at the world and to listen carefully to others; exchanging stories and observations about people, place, and identity; and reflecting on how our own lives connect to bigger human stories. We will be posting the new curriculum in its entirety in printable format on our website in the coming days; we are also working on a printable educator’s guide to aid educators in their planning. In the meantime, this blog post offers a preview of what’s to come by giving an overview of the new learning journey, before zooming in to look at specific changes within one particular footstep. FOOTSTEP 1: SETTING OFF. Students introduce themselves and explain their choice of avatar. They start a conversation about Paul’s walk and what interests them about it. FOOTSTEP 2: CREATING NEIGHBORHOOD MAPS. Students create visual representations of their local area, as seen through their eyes, and share a related story. FOOTSTEP 3: TAKING NEIGHBORHOOD WALKS. Students go for a walk in their local area and observe their surroundings carefully; they take photos to share with other participants. FOOTSTEP 4: LISTENING TO NEIGHBORS’ STORIES. Students interview an adult to learn about someone else’s experiences and memories of their local area. FOOTSTEP 5: DOCUMENTING THE EVERYDAY. Students carefully observe a place they know or something that people in their community do as part of their everyday lives. Drawing inspiration from Paul’s work, they create a short video, slideshow, illustrated guide, or evocative description to share with other participants. FOOTSTEP 6: LOOKING AHEAD. Students plan an actual walk they would like to take to try to understand more about the world and/or themselves. Or, they research a place that Paul could walk to from his current location and suggest the kinds of stories he should try to tell; we will pass on their ideas to Paul. In a nutshell, we have (1) retained the first four footsteps of last year’s learning journey, which were very popular; (2) developed a new activity for Footstep 5 which builds on the notion of slow looking and responds to the expressed desire of participants to learn more about each other’s lives and cultures; and (3) adapted one of the final footsteps from last year’s journey to bring a sense of closure to the learning journey. We are still designing the follow-up learning journey, but it will emphasize the idea of relating our lives to bigger human stories, and will include some other popular activities from last year’s learning journey. Now let’s look inside one particular footstep: click on the image to view. Please note that this document does not show the website format. Three-part footsteps. Last year, we paid most attention to designing the core learning activities for Out of Eden Learn. Furthermore, the graphic layout on our website meant that the “Get inspired” and “Interact” aspects of each footstep appeared subsidiary to the main activity of the week. We have changed our approach this year by making each footstep a clear, three-part process. Jon our developer is currently redesigning the footstep interface – which we look forward to sharing with you shortly. Please note that we will have pop out boxes for each component so that there is not an overwhelming amount of text visible at any one time. Also note that the two-week interval between footsteps means that students can spend approximately one week engaging with Paul’s journey and doing an activity, and one week looking at and responding to other students’ work. We hope that this tweaking of our design will help more students to tap into the full potential of the Out of Eden Learn experience. A friendlier voice. A fifth grade participant commented that it would be nice if our instructions showed “more enthusiasm” and were “less robotic”. This footstep reflects our attempt to find a balance between offering clear, concise instructions and a friendly, encouraging voice. Thank you for your suggestion esvillage of Massachusetts! More targeted instructions for engaging with Paul’s walk. Many participants told us that they would like more support for engaging with Paul’s Out of Eden Walk materials. While the example given here is fairly general, in other footsteps we ask students to watch specific video or audio clips or to read particular dispatches. As previously announced, we are annotating selected dispatches to help students decode vocabulary or cultural references they may find challenging. A tweaking of activities to reflect our revised learning goals. 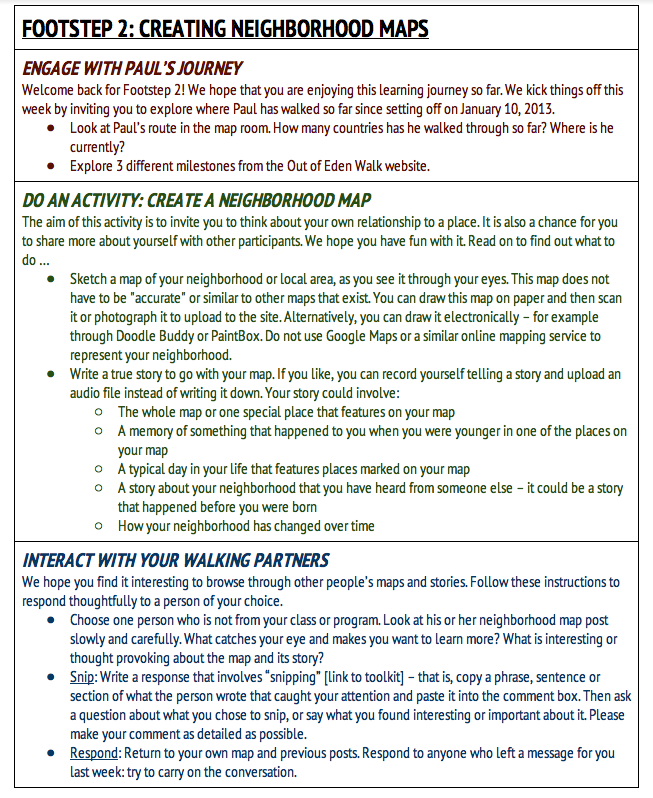 This version of Footstep 2 invites students to share a story about their map rather than a general written explanation. This subtle shift toward storytelling is in keeping with Paul’s overall endeavor on the Out of Eden Walk; we also believe it will open up more opportunities for connection making and dialogue among participating students. While some of the other footsteps more explicitly encourage students to slow down, we have integrated opportunities for close looking and careful listening throughout this learning journey. Also note that we have made an effort to offer students plenty of choices in terms of how they go about each activity. Our aim is to elicit a variety of responses from students and to encourage them to find their own voice within our space. More targeted instructions to help participants interact with one another. We are particularly excited about our new toolkit for dialogue, which we have incorporated into the third component of each footstep. Jon is currently working on the design of this toolkit so it is not yet ready to share. Our goal is to give students simple but effective strategies for listening and responding thoughtfully to one another – something that is not always easy to do, particularly in an online context. We are very curious to see how this new chapter of Out of Eden Learn unfolds! We sincerely thank everyone who provided us with feedback and suggestions, thereby contributing to this new design. We look forward to continuing to learn both with and from you in the coming weeks and months. I am an educator and want my students to take part in a learning journey this September. When can I sign up for Out of Eden Learn? You can register on our website right away. Everything is free of charge. We aim to assign classes to walking parties and launch the new curriculum during the first and second weeks of September. Please note that we welcome students of all ages from schools, after school programs, and home school settings. Can I be put in the same walking party as an educator I met through Out of Eden Learn last year? Yes! This year, all educators can request that they be placed with specific educators, whether or not they met through Out of Eden Learn. For example, you may want to take the opportunity to deepen existing ties with a school/educator in a different part of the world, or simply work with a friend. You will be able to make this request when we confirm with you that you want to take part in a learning journey this September. Also note that more than one educator can sign up to be responsible for a single class: in this case, one teacher registers the class and then passes on the special class code to his or her colleague(s). I have students who already took part in Out of Eden Learn and they want to carry on with it. What should they do? We believe that our revised learning journey is sufficiently different to make it worth the while of returning students to do it again this fall; we will also be sure to group them with different classes so that they have a different experience. In recognition of their prior experience, we will consider repeat students to be “special advisors” to Out of Eden Learn and will be sure to solicit their feedback on our new design. In the future, returning students will have a range of options for what they want to do next on Out of Eden Learn. I teach elementary school age students who are too young to post for themselves. How will this new design work for me? As was the case last year, educators of younger students will post on their students’ behalf and be grouped with educators who teach a similar age range. By making our curriculum available upfront, we hope that you’ll be able to adapt it to suit your own learning contexts – as well as to design and share your own activities. A new “back channel” feature for educators within each walking party will allow for easier communication among educators this year. We will group larger numbers of educators of younger students together so that you can learn from one another while at the same time form smaller collaborations among yourselves. For example, we strongly encourage Skype or Google+ encounters between classes; however, for privacy reasons we cannot organize or take part in them ourselves. What’s the latest about making Out of Eden Learn multilingual? There may be some very exciting developments in the works for making Out of Eden Learn a multilingual platform – but for now we are postponing our multi-lingual pilot until early 2015. We will, however, have some teaching materials available in Chinese this September. Please do not hesitate to email learn@outofedenlearn.com if you have any other questions. The roots of the future of youth education are in Out of Eden Learn.